The Altametrics Cloudbridge provides functionality for vendors and third party integrators to export POS/BOH data for automatic uploading to Hubworks applications. This document describes the acceptable formats and file conventions for this purpose. Five specific data points (net sales, transaction count, guest count, labor cost and labor hours) broken down by hour. The Hourly Summary can be run every hour during the current business date, or processed at day’s closing. Sales and transactions broken down into 15 minute day parts. Attributes include guest count, transaction count, net sales and gross sales. A list of named values, or daily keys. Some keys are standard and required for proper reporting by Hubworks. The exporting system can also generate a number of custom keys. The Daily Summary is uploaded at the end of the business date. If adjustments need to be made to prior business dates (e.g. labor adjustments), the Hourly and Daily Summaries can be re-exported, as long as they are within 10 days of the current business date Data can be provided as a set of four XML or CSV files. The exporting application must adhere to the strict file naming and format conventions which are described in this document. The Altametrics Cloudbridge will delete the export files after successful transmission. Any files in the export folder older than 30 days will be deleted automatically. Hubworks provides two different file types for exporting data: XML and CSV. Although CSV is supported, CSV files will be converted to XML before transmission to Hubworks, so XML is the preferred format. There are four different export files: the Hourly Summary, the Daily Summary, the Day Part Sales Summary and the Metadata. If metadata is written as a CSV file, an XML file will be generated from it, and the XML file will remain on disk until/unless the CSV file is updated. The Hourly Summary includes a list of five specific data points. The Cloudbridge Service will look for an Hourly Summary file for the current business date once an hour throughout the day. Hourly Exports can also be generated for past business dates (up to 10 days past), but these will only be uploaded by the Cloudbridge Service once a day. The exporting application should regenerate Hourly Summaries for previous business dates only if the data has actually changed since the previous export. The Hourly Summary should contain data only for a single business date. This means that if the business date closes at 2:00 AM, the entries for 1:00 to 2:00 AM represent data from the calendar date after the entries for 2:00 to 3:00 AM. The Hourly Summary should contain data for each hour of the day where data is available. It is unnecessary to export entries for hours which contain no nonzero values. Sales information, including net and gross sales, guest and transaction counts can be summarized by 15-minute day parts. This gives a finer level of detail than the hourly summary, but tracks fewer data points. Even though there is some overlap of the data points from the Hourly Summary and the Day Part Sales Summary, both exports are independent and both should be populated by the exporting application.Day Part Sales information should contain information for a single business date. If the business date changes after midnight, this means that the data will contain elements from two different calendar dates. Each line has a start time, represented in HH:MM format, with the period from midnight to 12:15 AM being “00:00”, and the period from 12:45 PM to midnight being “23:45”. 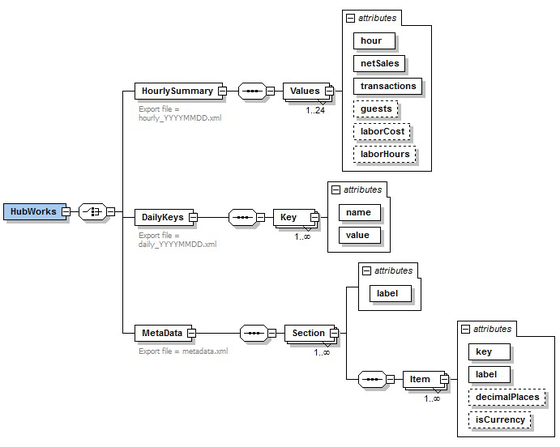 The Daily Summary is a list of Data Keys (named values). There is a list of standard key names that must be provided. Standard key names always begin with “$cb_” or “$hub_”. Standard key names are case-sensitive. The exporting application may also include custom data keys for fields that are not included in the standard keys. Custom key names may include alphanumeric characters, dashes and underscores. Values with invalid key names will be omitted from the upload. Custom key names are always converted to uppercase. The Altametrics Cloudbridge processes Daily Summary export files after the close of the business date. If the exporting application detects modifications to prior business dates, export files for those dates may also be generated, as long as these are not more than 10 days in the past. The following Daily Keys are listed by report section. Keys in bold are required to fulfill requirements for that section. Keys in italics are optional, but highly suggested if available to the exporting application. including standard and custom keys. where PAYMENTCODE is defined by the exporting application. Typical examples would be $hub_PAYMENT_CASH_Amt or $hub_PAYMENT_VISA_Amt. feed, matching those included in the Payment Amount Totals section. including those payment types not included in the top seven. the sum of the top seven payment types. where DAYPARTCODE is defined by the exporting application. Typical examples: $hub_DP_BKFST_Cnt or $hb_DP_LUNCH_Cnt. any additional categories beyond the top seven will be filtered. Typical examples: $hub_CAT_BEVERAGE_Cnt or $hb_CAT_SANDWICH_Cnt. $hub_CAT_Total_Cnt and the sum of the top seven categories. The exporting application may provide additional custom sections and custom data keys. The total number of daily keys must not exceed 100, including both standard and custom keys. Metadata allows the exporting system to describe the daily keys by providing meaningful labels and grouping them into report sections. Metadata can be exported in either XML or CSV formats. Metadata need only be updated when it changes. Unlike other exports, the metadata file is undated, and will not be deleted after export. Metadata is merged with each Daily Summary export. Any keys appearing in the metadata not appearing in the Daily Summary will be omitted from the metadata before transmission to Hubworks. For example, there may be 40 different sales mix categories defined in the POS, and each of these can be defined in the metadata, but the Cloudbridge Service will filter all but the top seven before transmitting to Hubworks. Labels can include any alphanumeric characters, most punctuation, and space characters. Punctuation characters may not include single quotes, double quotes or ampersands. Whitespace will be normalized, i.e. leading and trailing whitespace will be trimmed, tabs, newlines and other whitespace characters will be converted to space characters, and consecutive whitespace characters will be reduced to a single space character. The Altametrics Cloudbridge will provide the log files to give the authors of the exporting system some insight into how the system is behaving. Log files follow a similar dated naming convention, although the date in the log file name will be the current date, not the businessdate. The Cloudbridge service will automatically delete any log files older than 10 days.